The sculpture - also known as the Man in Motion - is made of welded steel mosaic and has the Wallace Monument and Stirling Castle as a backdrop. He said: "Whoever crashed into it has made a fair mess. "It looks like they've driven into one of the statue's legs and brought down abut five or six tonnes of metal. "I don't know if it quite stopped them but it certainly slowed them down." He added: "It's quite an arresting sight when you see it lying there. I have heard from a few people that they never liked it, although I doubt they would prefer it looking like this." 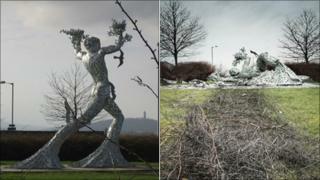 Glasgow artist Andy Scott is a sculptor, whose best-known works are in galvanised steel. His other projects include the Kelpie heads at Falkirk's Helix project and the Arria statue at Cumbernauld.